Joy in the Journey: What do you think? The response was overwhelmingly in favor of short daily blogs. So, what do you think? Which would you prefer? A or B? 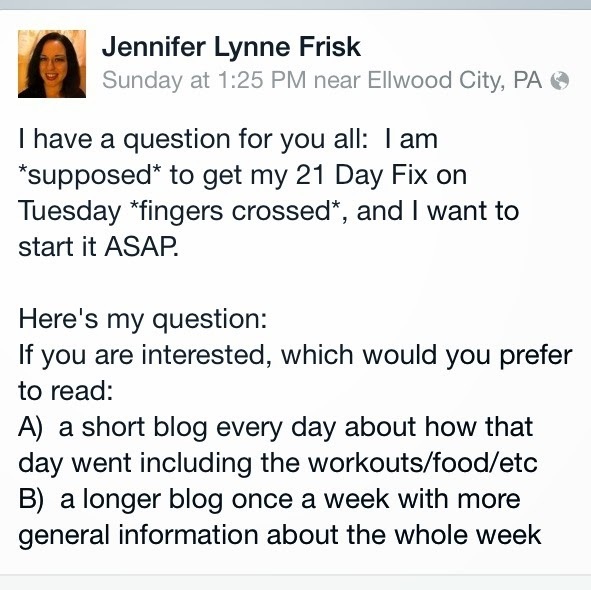 Short daily blogs with pictures and experiences for 21 days? Or the same format I've been following with a weekly feature? The plan is to start as soon as possible, with the possible caveat of Valentine's Day. You see, Valentine's is my favorite (or second-favorite - second only to Christmas) holiday of the year. I love the romance, the special-ness, the effort, the SPARKLE of this season of love. And one thing that I do for my hubby every year is to make some of his favorite foods - foods that are NOT healthy. But they are for him, and that's what matters. So anyways, the plan is to start either right away or - if there is more planning involved - Sunday. So, you have a couple days... What'll it be? Leave your answers in the comments! Oh, and if you're not already part of my Facebook community, why not? Come find me here. I look forward to meeting you!